We not only supply products to our customers but also collect the latest information to meet their every need. Especially by adopting global strategies before our competitors did, we have won confidence and trust from many customers. 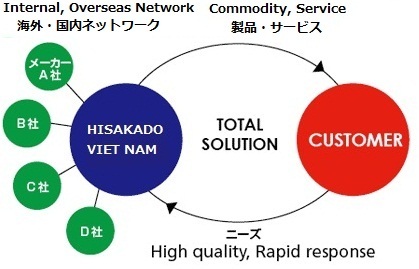 Our established network with Japan, Korean and other foreign manufacturers is a main source to provide high quality products in a quick and appropriate manner, enabling us to optimize our global procurement the best products to respond to our customers needs.